Happy Tuesday, Y'all! 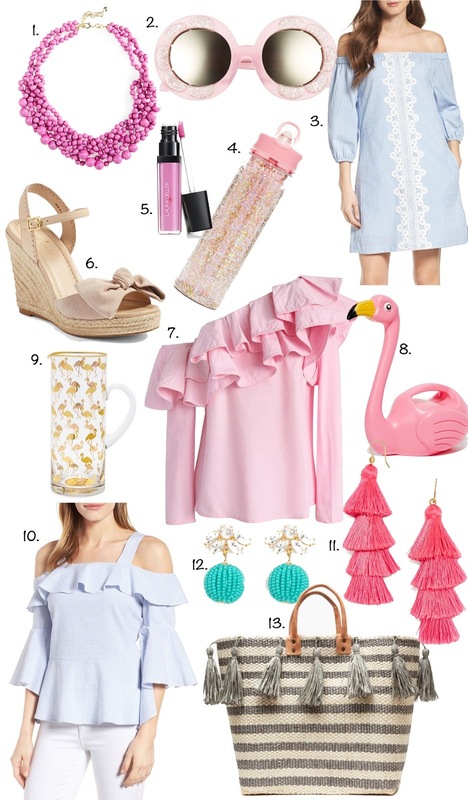 There are sooooo many cute things out right now for spring and summer! Pink and turquoise are my two favorite colors for the season. How darling is this one shoulder ruffle top?! It is so reasonably priced as well. This is also the perfect time of the year to wear tassels! I just purchased these tassel earrings in two colors! I'm also loving this tassel tote...the color combination is so perfect. I also just grabbed up this absolutely adorable ruffle seersucker piece. It comes in two other color options. These wedges are the perfect neutral shoe with a fun bow touch! And lastly, I can't get over how cute this gold flamingo pitcher is for all the summer festivities ahead. Those pink tassel earrings are darling!